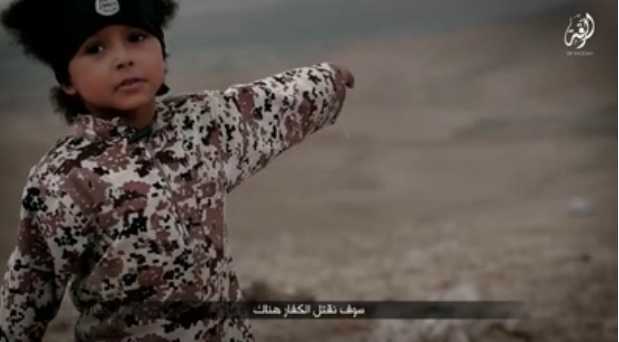 A new video released by the barbaric Islamic group ISIS, which identifies itself as the Islamic State of Iraq and Syria, shows the terror organization using a four-year-old British boy to help execute prisoners. The child appears in the video next to a Islamic fighter who delivers a message to United Kingdom Prime Minister David Cameron. “So prepare your army and gather your nations for we, too, are preparing our army,” he threatens. The child, who is dressed in fatigues and wears a headband bearing the Islamic State logo, speaks as well. “We are going to kill the kuffars (non-believers) over there,” he says in the footage, holding a detonator in his hand. The British publication The Mirror was able to locate the child’s grandfather, Sunday Dare, who expressed heartbreak over the situation. Dare remarked that he is disappointed that his daughter, Grace Dare, allowed her son to be used in such a way. It is believed that the child was taken to Syria in 2012, and the mother changed her name to Khadijah. As previously reported, ISIS released footage last year showing the terrorist organization training children as young as five years old to fight for Allah. According to reports, the video was filmed at the Al Farouq Institute for Cubs in Raqqa, and was stated to represent the “next generation” of ISIS fighters. In addition to performing exercises, children recited verses from the Koran and bowed to the ground in prayer with their instructor, who sat adjacent to a pair of guns.